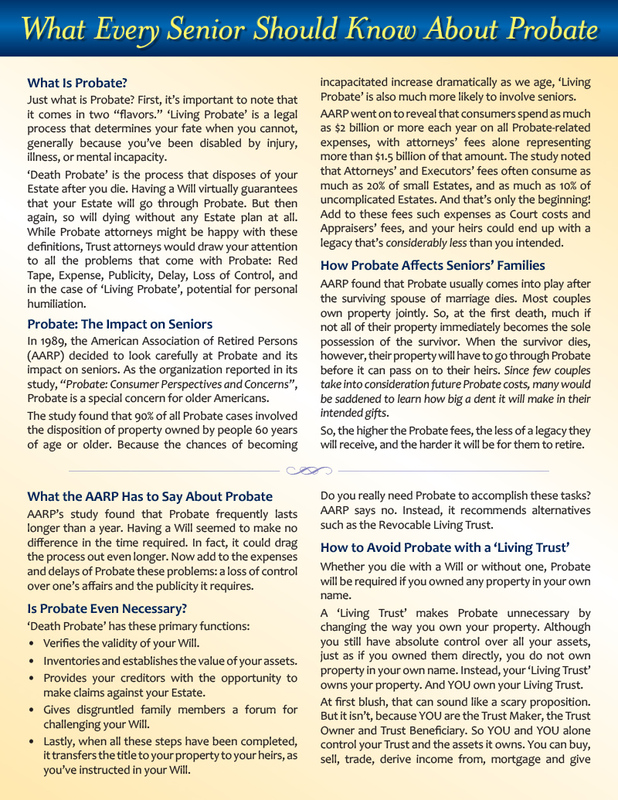 A. Probate is designed to create a “final accounting” upon death. It is the legal process of “proving up” a Will, or verifying that a Will is valid. This takes place in one of two instances. First, if a person dies leaving behind a Will, or second, if the deceased has died intestate, that is, has not left behind a Will or estate plan of any type or the Will cannot be found. A. Depending on the complexity of the estate and the thoroughness with which accounting has been carried out before death, probate can either be a relatively simple task or a daunting one. Be aware that no matter the situation, probate may be a lengthy process often taking months or possibly years to play out, and one which may take a considerable amount of an executor’s time. A. Probate begins and ends with the special Probate Court set up in each state to handle estate issues. (Sometimes known as the Orphan’s or Chancery Court in certain states.) All actions taken regarding the estate are accountable to this court, and must be noted and reported regularly. 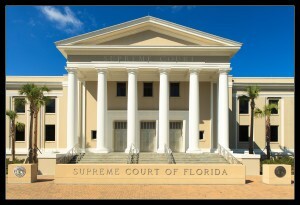 This court is staffed by special judges qualified to oversee estate resolution issues. Although the trust administration process seems relatively straightforward, there are several reasons it can sometimes be drawn out over several months or even years. The first step, the inventory of assets, must be completed before the trust administration can begin, and this can be difficult to complete depending upon the prior organization and the size and complexity of the decedent’s assets. Next, the 706 estate tax return must be filed within 9 months, or 15 months if an extension is filed. Often, it is prudent to wait until the last minute to file this form. If the spouse of the decedent is in failing health and may pass away before the deadline, then both 706 forms can be used to maximize tax advantages to the estate. The final step, asset distribution, cannot take place until the 706 has been filed, and even then should not take place until the “Closing Letter” is received from the IRS certifying acceptance of the 706 return. This closing letter will take a minimum of 6 to 8 months, and as long as 3 years, to arrive after the 706 is filed. A. 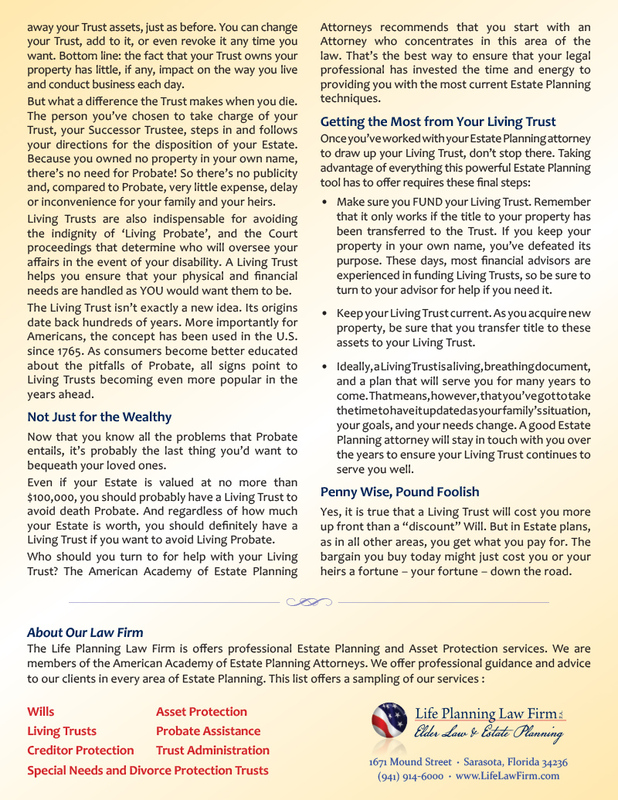 While having a living trust can significantly reduce costs compared to probate, there is still a considerable amount of work to be done in properly administering even a simple living trust. The services of an attorney are required, and that person or firm should be compensated fairly for their services. It is important to remember that the fees allowed for trust administration are usually much lower than those for probate, and there is generally less work involved, as there is less involvement of the courts and state bureaucracy. A. If you are a relative of the deceased, this is simple. To transfer the title of vehicles owned by the deceased, simply take the death certificate to the DMV, and perform the transfer, paying whatever fees they require. If not a relative, bringing along the will and or any trust documents indicating your status should be sufficient. A. Social Security will continue to send out benefit checks until they are notified of an individual’s death. The executor/spouse/trustee should contact the local Social Security Administration office and notify them of the death, or if a benefit check is received, send it back with a letter notifying them. This is important. If checks continue to be deposited, the recipient can incur liability later when Social Security learns of the recipient’s death.